On 01/09/19 and at approximately 8:00 PM, members of the Pomona police department’s Major Crimes Task Force Identified our third outstanding Suspect related to this incident. Henry Chacon was located at a residence where he was taken into custody without incident. Chacon was arrested for Grand theft auto, Possession of a controlled substance for sales, outstanding probation warrant and felony evading. Chacon is a known documented Pomona gang member and was booked at the Pomona city Jail. On Thursday, January 3rd, 2019, around 8:45 PM, members of the Pomona Police Department's Major Crimes Task Force (MCTF) were conducting high visibility patrol in the area of Third Street and Towne Ave. During their directed patrol, officers observed a black Toyota Camry with no front license plate. This vehicle was occupied by multiple known gang members. Officers activated their emergency equipment to initiate a traffic stop but the vehicle failed to yield. The vehicle came to an abrupt stop in the area of 9th St. west of Towne Av. and Suspect Soldridge fled from the vehicle on foot. The vehicle then fled the area where Suspect Soldridge fled from the vehicle. Without hesitation, officers chased Suspect Soldridge on foot. During this foot pursuit, a pursing officer was injured. This officer was taken to a local hospital where he was medically treated. The officer is doing well and was later released from the hospital. While Suspect Soldridge was running from additional pursuing officers, he dropped a firearm later learned to be a replica firearm. Suspect Soldridge was taken into custody a short distance away without incident. As officers were responding to this call, officers located the fleeing vehicle. Officers initiated a traffic stop again and this time the driver Suspect Cota stopped the vehicle and surrendered. Suspect Cota was taken into custody without incident. There is currently an outstanding third suspect from this incident. 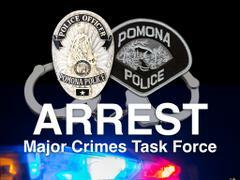 Both detained Suspects were arrested on probation violations and booked at the Pomona City Jail. The City of Pomona is dedicated to addressing quality of life issues. The Pomona Police Department will continue to take a “Zero Tolerance” approach to Gang related crimes.